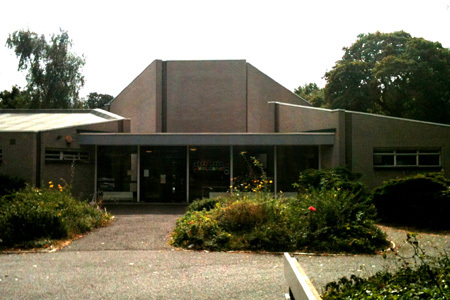 The church: Quaker Meeting House, Wanstead, London. Denomination: Religious Society of Friends, Britain Yearly Meeting. The building: I'm guessing it was built in the 1960s. Lots of glass and concrete. Not particularly attractive, though the setting is lovely (there are woods all around it). The building has a hexagonal meeting room with various rooms either side of it (library, kitchen, etc.). The church: I wasn't able to find out very much about their activities. There is a newsletter posted on their website, but it is over one year old. According to that newsletter, they sponsor a men's group, a painting class, and social outings. They also sponsor a Becoming Friends Group, described in the newsletter as "a course exploring our Quaker experiences and beliefs." They make their various facilities available for bookings. The neighbourhood: Wanstead is a suburban area in north-east London. The meeting house is pretty near the centre of Leytonstone, to the north of Wanstead. When you are in the building, you feel as if you could be in the countryside because of the surrounding woods. The cast: Nobody leads the service in a Quaker meeting! The date & time: Sunday, 16 September 2012, 11.00am. Just over half full. There were about 40 people present (mostly adults) with room for about another 30. Most of the adults were middle-age upwards. Interestingly, unlike most churches, it was about 50/50 male and female. I was welcomed before I even entered the building! A lovely man called Peter came up to me as I walked along the driveway and chatted to me. People in the entrance area chatted to me as well. There were two teenagers on the entrance door welcoming people. Nobody chatted once we went into the meeting room, as the meeting starts in silence. No pews but lots of black plastic chairs and a few armchairs, one of which I chose. Pre-service atmosphere was in the entrance hall. Lots of people chatting. One of the elders shushed people just before we went into the meeting room. 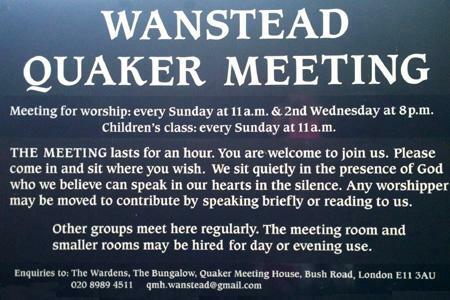 There are no opening words in a Quaker meeting. Everyone went into the room and sat down. The meeting started in silence. There was a table in the middle of the room, with the chairs arranged around it in three concentric circles. On the table were various books, one of which was The Holy Bible, Revised English Version. I think one of the others was a guide to Quaker life and experience (not sure of exact title). Very little. Everyone sat in silence for an hour, apart from two people who spoke briefly. The children went out after about ten minutes and came back five minutes before the end, but it was done with the minimum of fuss. I did spend quite a bit of the meeting wondering if the gentleman sitting near me was the actor, Peter Vaughan, but it turned out he wasn't. The worship was almost completely silent and incredibly peaceful. Most people sat with their eyes closed. I spent a lot of time looking at the woods outside (there were large glass windows). The peace and quiet. I would imagine if you had a very hectic lifestyle, this hour of virtual silence would be an absolute joy! Also the fact that everyone I met was incredibly friendly and welcoming. Very hard to find anything to write here. There were quite a lot of reports/notices after the meeting, which did drag on a bit, but that seems a very trivial complaint as it was all necessary information. The man who spoke to me on the driveway came over and asked me how I had found the service. We chatted for quite a while and then he showed me around the building. I then went and had a coffee and was invited to stay for lunch! (They were having a special lunch to celebrate the end of the Olympics/Paralympics). Unfortunately I had a prior lunch engagement so was unable to, but I would have stayed if I could have. It was instant coffee, not my favourite, but fair trade as I would expect from Quakers. It was strong enough, though, and hot. There were nice cookies available and plenty of food for the lunch, which looked delicious. 7  Unfortunately it's a bit too far from where I live to be my regular church. Also, whilst I loved the peace and quiet, I missed the usual things such as prayers, a sermon, singing, communion, etc. I didn't feel as if I had been to church, but that may say something about me. Difficult one to answer, perhaps because it wasn't overtly Christian. I certainly appreciated the space to be still and reflect, though. Actually, two things! The peace and quiet and the incredibly friendly welcome.